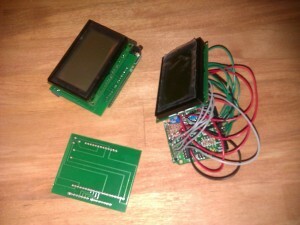 Some time ago I wrote on the Arduino forums asking for help (read: “Could someone do this for me?”) with a PCB design. Unsurprisingly, no-one offered their time and effort to design the PCB for me. So, in the end, I just had to learn to use Eagle myself. The project I was working on involves an Arduino compatible microcontroller board and a graphical LCD panel. This page on the Arduino Playground describes how to connect such a GLCD to an Arduino. The resulting spaghetti of wires was not to my liking, so I decided that a PCB would be a much neater way of connecting the two. After learning how to use Eagle, I designed the PCB and sent the resulting Gerber files to BatchPCB. And then I got bored with the project and forgot about it for nearly a year. On the left, the GLCD connected to the Freeduino, using my PCB. On the right, the original prototype, connected with wires. Which one would you rather use? 🙂 In the foreground is an extra shield PCB waiting to be soldered. In case someone thinks such a PCB is a rather clever idea, here are the Gerber files for the board, and here is the BatchPCB product page for it. The board could be optimized a bit so it would fit completely under the GLCD board, and there are other small details that could be improved on, but the board works, and for now, that’s good enough for me. Note that the PCB is only compatible with GLCDs with “pinout A” as defined in the GLCD library documentation. I’ve tested it with this GLCD from Sparkfun. arduino_glcd_gerber.zip, includes Gerber and Eagle files. Awesome PCB! I know it a 1 years old topic but I’m trying to do the same thing. So I was thinking if maybe you could send me your eagle doc so I can optimize the PCB. Sorry for my bad english I’m french. What were you planning to improve on the board? The main thing that annoys me is the fact that the GLCD sits slightly offset from the Arduino. If all the components were stacked right on top of each other, the whole thing would take a bit less space. Also, since this is my first and so far only thing I’ve done with Eagle, the PCB could use some documentation, like what it is and what’s meant to be connected where. Once you’re done with your version, make sure to post a link to it here, so I can see what you’ve done with it! No problem! Post a link to your version once you’re done, if you would.